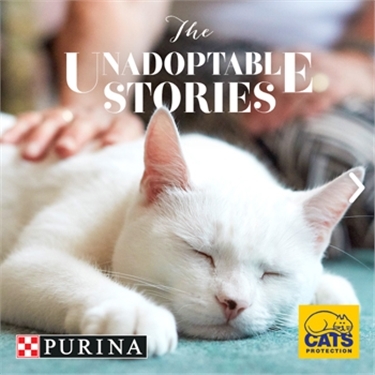 PURINA® and Cats Protection have today launched a new campaign, ‘The Unadoptable Stories’, for four weeks. Purina has been the charity’s partner for over 30 years and is a huge advocate of pet adoption. Through this campaign we want to highlight that no matter whether they have medical conditions, are a little older, or just a bit shy, every cat deserves to find their perfect match, as we believe no cat is unadoptable. In fact, it’s actually some cats’ seemingly ‘Unadoptable’ qualities that make them the perfect match for someone looking for something special. We tell the story of three of these cats and owners, all of whom found their perfect match. Read ‘The Unadoptable Stories’ below. The campaign will be visible across social platforms and media from 20 August and on 7 September will also have in-store activation in selected Sainsbury’s stores for one day. The full list of 70 stores is available at the end of this article. Please pop in to find out why no cat is unadoptable and pick up a a Go Cat and Felix/Gourmet money off coupon. “When Cats Protection told me Sam had hearing problems: ‘So what?’ I said. I’m profoundly deaf, I wear two hearing aids, it’s just one of those things. Anyway, if people annoy me I can always turn them off. I’d lost my last cat and my husband within a very short time of each other and it hit me very hard. “I’m allergic to cats, so I’m not exactly what you’d describe as a typical cat person. I’ve always wanted my son Henry to feel the happiness that cats can bring but I couldn’t have a cat living in the house. When I chatted to Cats Protection about adoption, rather than look at me as if I was bonkers, they saw me as the possible answer to one of their cat’s very unique needs. That cat was Belle. “We first saw Coco when we looked into adopting a cat for our little girls. Being young, they had their hearts set on a kitten, while Lara, my wife, had always wanted a black cat. This came from her childhood love of witches. Her favourite TV show growing up was Sabrina the Teenage Witch, and the witch had a talking black cat as a pet. We could not believe it when Cats Protection told us that many of the cats in their care are actually black, because many people simply don’t want them. This made Lara really sad. She made up her mind right there that Coco was going to be ours. She even thought about renaming her Salem, after the cat from the TV show! But thankfully, we persuaded her to keep the name Coco. The girls weren’t at all sad that she’s not a kitten, they absolutely love her.